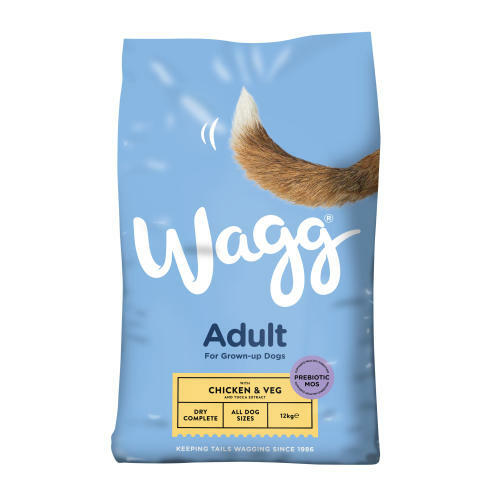 Wagg Complete is, like the name suggests, a complete and balanced diet, containing all the nutrition a dog needs. Complete dry dog food formulated with chicken. Omega 6 & 3 oils help promote healthy skin and a glossy coat. Crunchy kibbles help oral health by cleaning teeth & gums. Ingredients: Cereals, Meat and Animal Derivatives (including 4% beef in red kibble), Oils and Fats, Derivatives of Vegetable Origin, Vegetables (4% peas in pea kibble), Minerals, Yeasts (0.08%), Citrus Extract (0.04%) & Yucca Extract (0.01%). Nutritional Analysis:Protein 21%, Fat Content 8%, Crude Fibre 3%, Crude Ash 8.5%, Omega 6, 1.4%, Omega 3, 0.3%. Nutritional Additives: Nutritional Additives: Vitamin A 12,000 iu, Vitamin D3 1,200 iu, Vitamin E (alpha tocopherol acetate) 90 iu, Vitamin C (ascorbyl monophosphate) 50 mg, Iron III Ferric Oxide 900 mg, Calcium Iodate Anhydrous 3 mg, Cupric Sulphate Pentahydrate 40 mg, Manganous Oxide 80 mg, Zinc Oxide 55 mg, Zinc Chelate 390 mg, Sodium Selenite 0.2 mg. *Colourants, Antioxidant, Preservative. *Colourants - from a mineral source found in nature.